On April 27, 2015, astronomers using NASA�s Hubble Space Telescope discovered a tiny moon orbiting Makemake, a dwarf planet located beyond the orbit of Neptune, roughly 4.8 billion miles from Earth. The moon, nicknamed MK 2, is estimated to be just 100 miles in diameter. Source: NASA's Goddard Space Flight Center Cover image courtesy of NASA/ESA/SwRI/A. 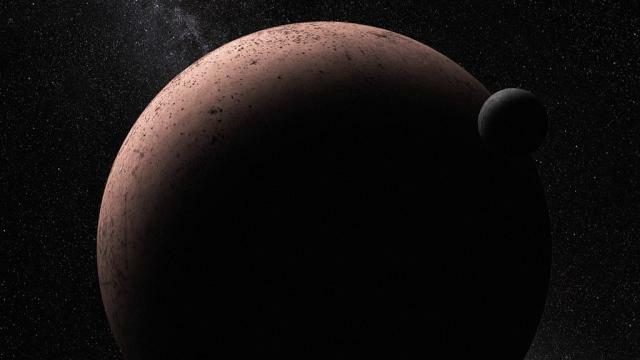 Parker Makemake artist concept courtesy of NASA Hubble images courtesy of NASA/ESA/SwRI/A. Parker and M. Buie Hubble Space Telescope image courtesy of NASA/ESA.